Provide comfort for the family of Patricia Hinn-Conway with a meaningful gesture of sympathy. Worley-Luginbuel Funeral Home, Grove, Oklahoma 918-786-2261.Patricia Joan Hinn-Conway 86, went to be with her Lord and Savior on Friday, February 8, 2019. She was a resident at the Grove Nursing Center. Patricia was born on December 15, 1932 in Santiago, Chile. She was the loving daughter of George Clarke and Mercedes Eugenia Cisternas. Patricia grew up in Rio de Janeiro. She met and married Robert Paul Hinn. They lived in New York City, Franklin Lakes, New Jersey, Mexico City, Mexico, Plainview, Texas and Ruidoso, New Mexico. After Robert’s death in 1993, Patricia moved to Grove, Oklahoma where she devoted her time to the St. Elizabeth Parrish, her family and her friends. Patricia met and married Alvin Conway in Grove. Patricia was preceded in death by her parents, and her loving husbands, her son John A. Hinn, grandson Nathan A. Hinn, her sister Hazel Kitover and her brother Richard Clarke. She is survived by her two sons, Michael Alexander Hinn and Robert Clarke Hinn and his wife Kimberly. She was blessed with three grandchildren; Christina Lyonn and her husband Jeff, Robert Paul Hinn, and Addison Clarke Hinn and his wife Becky and great grandson Alexander Maximums Lyonn. There will be a Rosary and viewing at Ellis Chapel at 6 PM on Monday, February 11, 2019. A funeral mass will be held in the St Elizabeth Catholic Church in Grove at 2 pm on Tuesday, February 12, 2019. Patricia will be laid to rest in the Plainview Cemetery in Plainview, Texas. Online condolences can be made by viewing Patricia’s Book of Memories at www.honoringmemories.com or on the Worley-Luginbuel Facebook page. Memorial donations can be made in Patricia’s name to your favorite charity. 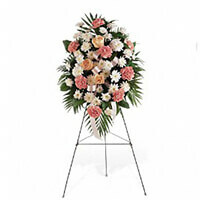 To send flowers in memory of Patricia Joan Hinn-Conway (Clarke), please visit our Heartfelt Sympathies Store. Tom and Lucy Murphy sent flowers to the family of Patricia Joan Hinn-Conway (Clarke). With deepest sympathies and prayer. Tom and Lucy Murphy purchased the Gentle Thoughts Spray for the family of Patricia Hinn-Conway. I memory of a great person. You will be remembered. I miss her but I haven't contacted her since my wife died. don't know why as I thought of her daily. She was the greatest person for making you feel welcomed and loved. Will miss her probably as much as my wife. Wish you all the best & hope you can handle this with out too much pain.